In America, jerky is a typically a piece of meat with a leather-like consistency that you can find at an outfitter or possibly a foodstuff that induces people into pranking a sasquatch. Unless you’re going to embark on the Oregon Trail in a covered wagon and are in desperate need for gas station procured sustenance that has the shelf life of a full year, give your teeth a rest and throw that piece of meat by the wayside. 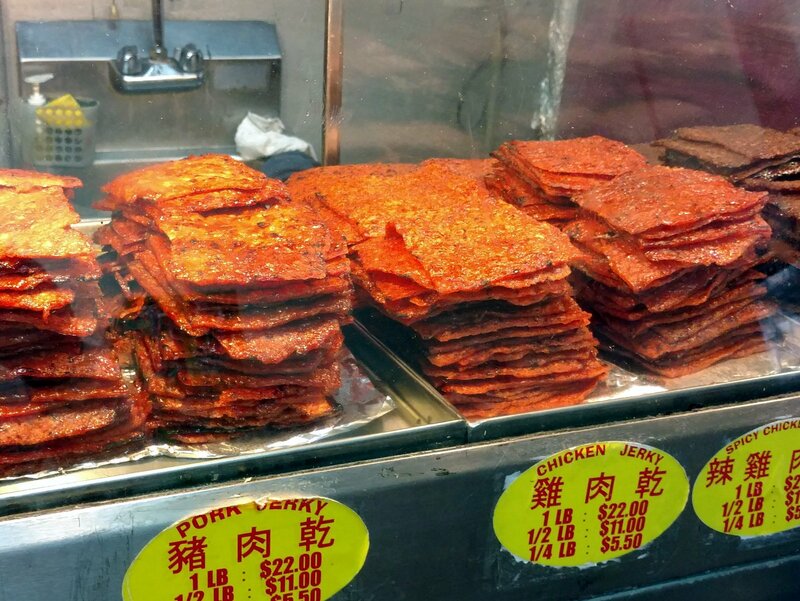 There’s a new sheriff in town, and if you’re in Asia or near an American city that has a large Chinese population, you may be able to take your jerky game to the next level. 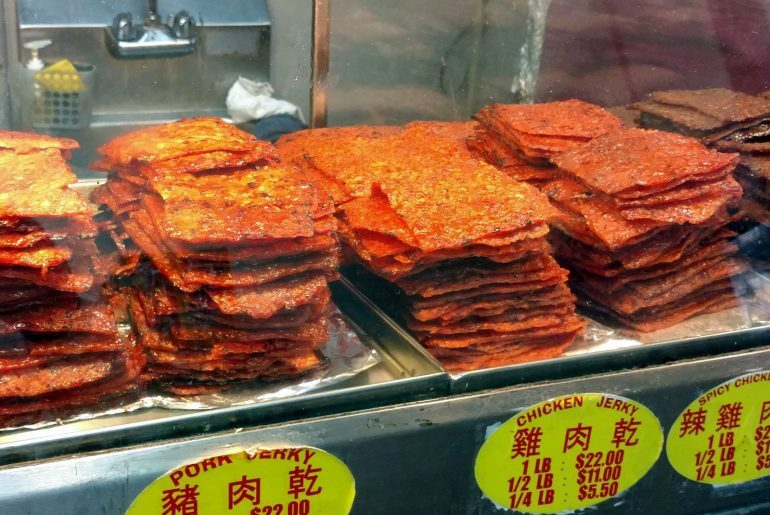 In Asia, you may see it listed as 肉乾 or 肉干, but in the English speaking world, you’ll most likely see it referred to as Singaporean / Malaysian Jerky. 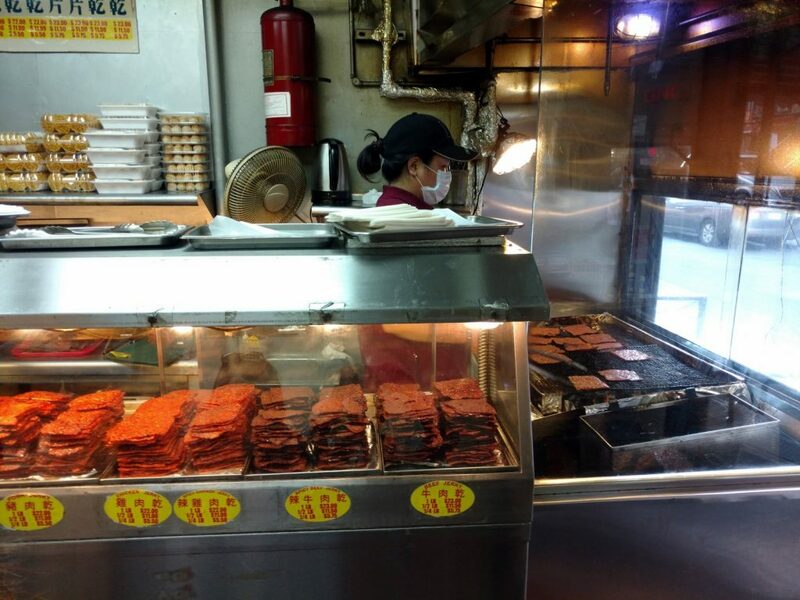 The first tell-tale sign that you’re in the right type of shop is that you’ll see them grilling the meats right in front of you, so it’s always a good decision to eat some of that fresh jerky as soon as you purchase it. 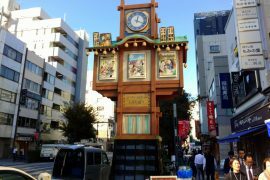 They’re typically sold by the pound, and may come in different meat types (pork always a good choice), and will probably have a spicy option if you enjoy a little kick in your food. When you take your first bite, the first thing you will notice is that it’s very moist, has some sweetness mixed in with savory tones, and possibly some heat if you went with a spicy variety. This is a far cry from the dry, and salty hunk of meat that is readily available at your grocery checkout line. If you’re getting some as gifts, remember to refrigerate as it’s not as shelf-stable as regular jerky. Also, it can get a bit pricey, so make sure you do the math as you order so you won’t have to list “over-indulgent meat order” as the reason you file for bankruptcy. 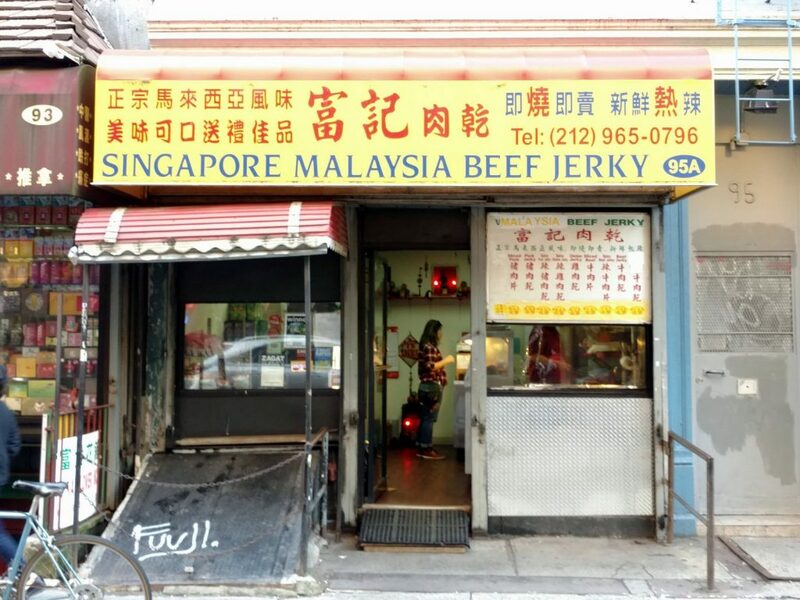 Walked past a couple shops in New York City Chinatown that had this type of jerky, Singapore Malaysia Beef Jerky, and Ling Kee Beef Jerky. In Richmond, BC, tried some from Mei Jan Hong at the Aberdeen Centre once before and in the Los Angeles area there’s a Fragrant Jerky in Rosemead. 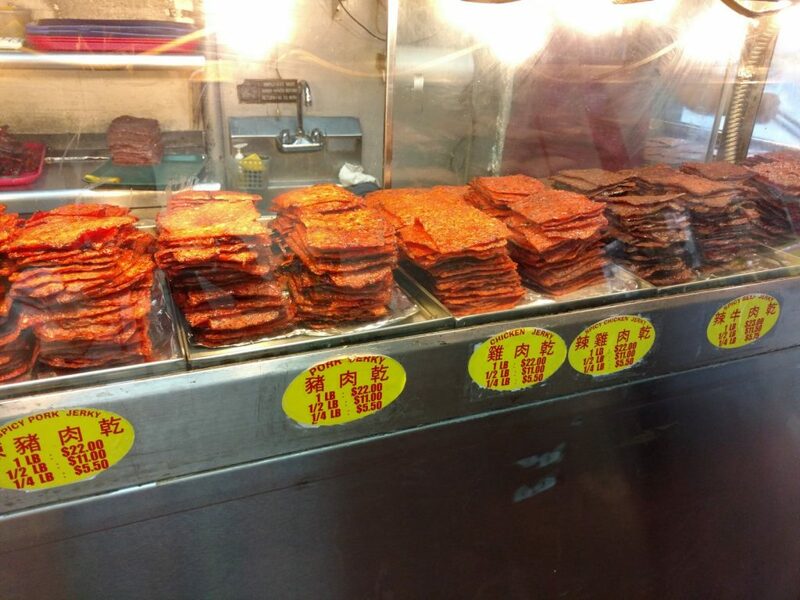 For other choices, type the largest city near you into a search engine and add the keywords ‘Singapore Malaysia beef jerky’ and pray that there is a location near you. 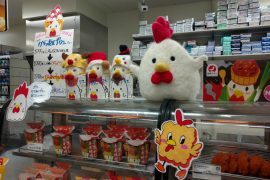 Or if you happen to be in an Asian country, running into a shop of this type is a much more common occurrence so give one a try if you haven’t done so already.